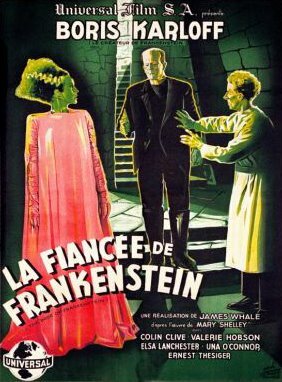 Frankensteinia: The Frankenstein Blog: "Imperishable"
The daily Libération mentions “the return of two magnificent films by James Whale… with Boris Karloff as the unsettling cadaveric Creature”. 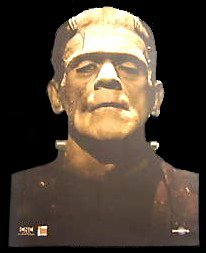 Annie Copperman of Les Échos enthusiastically notes the release of the two classics starring “the legendary Boris Karloff”. 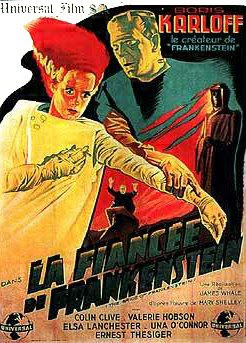 Of the performances, Moury calls Karloff’s interpretation “unsettling”, Colin Clive’s Frankenstein is “feverish… nervous and original”, Dwight Frye “imbues the character of the sadistic hunchback and body snatcher with a virulence that is very modern and surprisingly violent” and Edward van Sloan plays his part with “finesse”, but the other roles are “conventional and uninteresting”. Boris Karloff’s performance is called “sober and profound”. The evene.fr reviews are accompanied by video clips: The Monster’s tragic lakeside encounter with little Maria, and the Bride of Frankenstein trailer. “Imperishable” means “enduring forever”. Some 75 years after they were made, Frankenstein and The Bride of Frankenstein, it seems, have lost none of their magic and their power to enthrall. Image at top is Carlotta Films’ die-cut pressbook for the new French theatrical release. The posters are from previous French re-releases. The one at left is the poster for the 1946 edition. See it larger here. With this film, the critics are right! Oops! I meant to say "with THESE films"! They are both among my very favorites, and seeing a new print of FRANKENSTEIN two years ago at an old movie palace was an unforgettable event. Lovely to see these wonderful films getting their due all these years later, Thanks for sharing those. Great story. It's amazing to think 75 year old films could whip up so much critical comment and admiration. Sadly, I don't see something like this happening in the US. Leave to the French to treat our important cultural artifacts with the respect they deserve!